Graf Spee sinks the British steamship Clement off Pernambuco, Brazil. Polish government-in-exile set up in Paris. The French Army is called back into France from its invasion of Germany. The attack, code named Operation Saar, only penetrated five miles. French troops withdraw from German Saar Region. 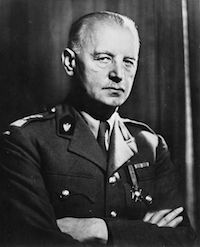 Gen. Wladyslaw Sikorski named first prime minister of Polish government-in-exile. British civilian casualties for the month September announced: 6,954 dead, 10,615 injured. Newcastle bombed, but only the second serious raid on Britain in a month with SeptemberÃ­s casualties listed as 217 killed. The guard at a detention centre in Peel on the Isle of Man is strengthened after disturbances, which results with 20 British fascists being moved to Liverpool. As part of operation ‘Typhoon’ Guderian’s Panzer Group 2 opens its offensive against Moscow, 2 days ahead of the rest of Army Group Centre and makes 50-miles in its advance towards Orel. Top-scoring Luftwaffe ace and Nights Cross with Diamonds winner Hans-Joachim Marseille (158 British aircraft) of 3./JG 27 is killed in a flying accident. The Women’s Army Auxiliary Corps becomes the Women’s Army Corps, a regular contingent of the U.S. Army with the same status as other army service corps. The British announce that 5,211 casualties were suffered at Salerno. The Russians make Dnieper River crossings on a 300-mile front. On the eve of the Jewish New Year, the Gestapo and Danish Nazis begin rounding up all Danish Jews. Rejoicing in the streets of Dover at the announcement that the last of the German cross-channel guns, which have pounded the southeast coast of Britain for three years, have been silenced. The 7,500 strong Calais garrison surrenders to the Canadians. An international military tribunal in Nuremberg, Germany, found 22 top Nazi leaders guilty of war crimes.